A big shift has hit the wholesale market, sparking discussion and initiatives among dealers and auctions, alike — multiplatform selling. Multiplatform selling is gaining steam, as more and more dealers and others in the industry warm to the concept of having vehicles loaded for sale on one channel simultaneously appear on other channels available for bidding or purchase. Brad Hart, industry veteran and chief operating officer of TradeRev, talked a bit about the plusses of multiplatform selling during a panel discussion at the 2014 Auto Remarketing Canada conference in March. Hart said this does help dealers buy, of course, but also has the potential to make bidding more competitive as more eyes see the same vehicles. One of the most recent developments for this push occurred In early March at the NAAA/CAR/IARA event in Las Vegas, where in a joint announcement, Manheim, ADESA and the independent auctions said they have made significant progress toward the creation of a multiplatform bidding solution that would facilitate simultaneous bidding on vehicles listed on multiple online auction sites. The statement from these auction parties says that the proposed multiplatform solution is different from any other technology solution currently available in that it would allow a consigned car to receive bids from multiple online auctions from the moment the car is offered for sale until the time the car receives the winning bid. A multiplatform steering committee was also formed by Manheim, ADESA and representatives from the U.S. independent auctions. This committee will oversee the development of the industry-wide initiative. There has also been a technical committee formed by industry representatives, who are approaching the final design of the architecture of the multiplatform bidding solution. Additionally, the steering committee has brought in Auto Auction Services Corp. to build and maintain the hub technology used to facilitate the distribution of the inventory and the synchronization of the bidding activity between the multiple online platforms, the statement said. This is just one development among many as the industry pushes toward multi-platform selling and the changes that are bound to come with it, such as standardization of condition reports. In mid-January, U.S.-based Auto Auction Services Corp. announced a new industry standard for vehicle condition data reporting — developed in partnership with Manheim — that is designed to foster consistency throughout the business. “Customer report technology improvement and the ability to create the virtual vehicle is a competitive advantage and will come from different channels. So, I am all for standardization but also for innovation. May the best condition report win,” Hart explained. Interestingly, Matt Rispin, owner and partner at North Toronto Auction, already has direct experience with the multi-platform selling model. In 2009, North Toronto Auction launched multi-platform selling with the wholesale platforms AutoGavel, OPENLANE (pre-ADESA ownership), OVE and SmartAuction. The bottom line: If multiplatform selling and bidding become the norm, buyers and sellers are in for some big changes. That said, he noted he is always cautious when competitors start working together. At North Toronto Auction, Rispin said they haven’t heard much talk from consumers on the topic, but their ears are to the ground. “Our customer’s haven’t asked us directly about it, so we are in a cautious wait and see. That being said, we have built our business by working with our customer’s to achieve their goals. If we start hearing about interest, we will take the next steps,” he concluded. 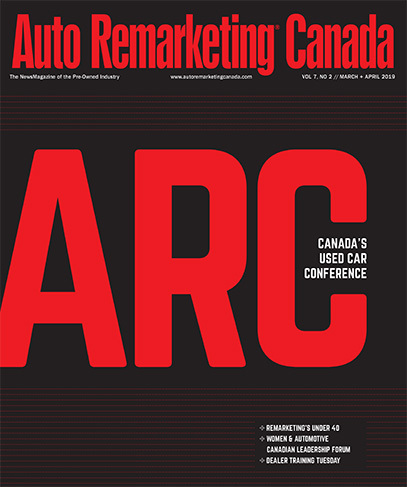 For more on the latest developments in strategies for selling, stocking and sourcing used vehicles, see the Auto Remarketing Canada May/June issue set to hit the Web this week. The Technology Issue covers digital trends and strategies as well as info on new Web-based tools that are helping dealers otpimize their pre-owned performance.